The rear axle is from an SD1. 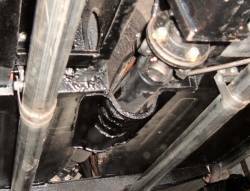 The SD1 axle is the right ratio (3.08 to 1 from memory) and is a great deal stronger than the standard MGB V8 axle. Only snag is it needed to be narrowed which would mean custom halfshafts. The SD1 axle is quite a lot wider than the MGB axle. I believe it's possible to run the SD1 axle without modifications in a car with Sebring wheelarches, but I chose to retain the original appearance of the car. 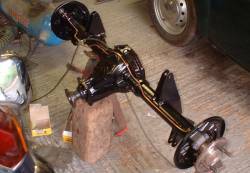 The axle was shortened by Hauser Racing in Northamptonshire. 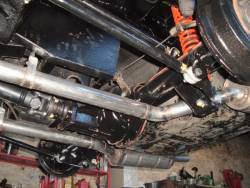 They fitted new driveshafts - custom made in the USA, as shortened driveshafts can be prone to breaking. 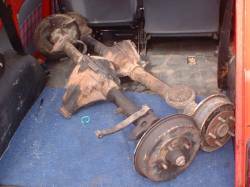 I've kept the original SD1 brake drums, so may need to fit a brake proportioning valve at some point. It was easier to keep the SD1 drums rather than use the original MGB drums, although at the time of writing the SD1 drums are no longer available. I had to obtain a complete axle just for the drums. 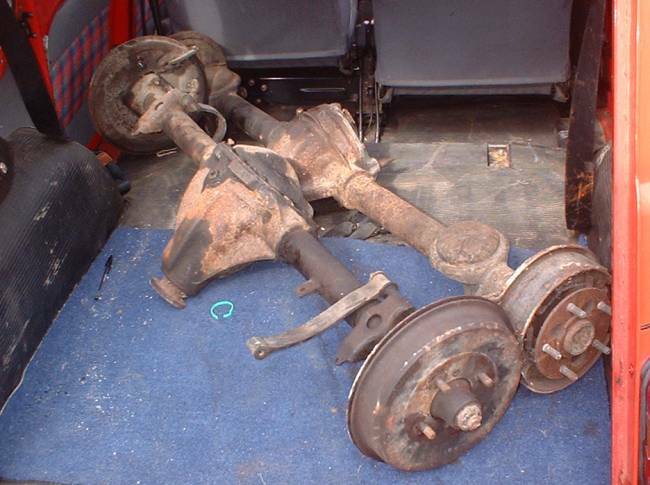 The modifications to the axle can be seen on the 4 link rear suspension page. 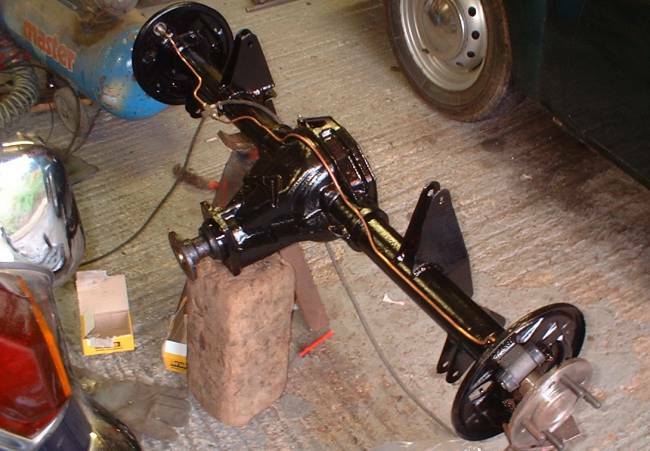 A custom propshaft was needed to connect the R380 gearbox to the SD1 axle. Reco-Prop in Luton made me a very sturdy propshaft with 2.5 inch tube and joints so big that they barely pass through the transmission tunnel. 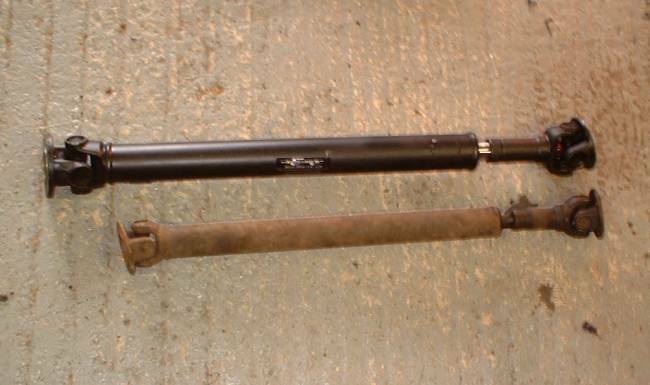 The photograph also shows an old MGB propshaft for comparison. The transmission tunnel bridge panel (in the centre of the photo) is a rubber bumper part which is deeper. I had to do some last minute modifications to increase clearance on full droop. Due to the the space taken up by the rear springs, the handbrake cable had to be routed in front of the axle. I used the standard MGB cable and pivot, and added a cable guide on top of the axle. The front pulley on the axle is from a Triumph TR7. They use the same axle as the SD1 but with a less suitable ratio. It's written elsewhere that you need to fit the front seal housing from the TR7 as well as the pulley. This is not the case - I've retained the SD1 front seal housing. Axle noise is common in the MGB and Rover SD1, so it's no surprise really that I have some axle noise. It can get annoying between 50 and 60mph particularly on trailing throttle. I'll do an investigation to see where the noise is getting into the car. I suspect the upper wisbone mountings or the suspension arm mountings on the axle could be resonating at ale noise frequencies.